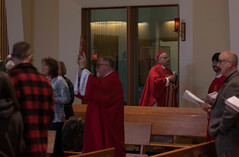 The three Alaska Bishops gathered in Juneau for a meeting of the Alaska Catholic Conference of Bishops celebrated a Mass for the Election of a Pope on Tuesday, March 12th at the Cathedral of the Nativity of the Blessed Virgin Mary. 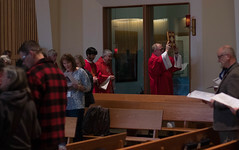 Archbishop Roger Schwietz (Anchorage), Bishop Donald Kettler (Fairbanks) and Bishop Edward Burns (Juneau) were assisted by Deacon Charles Rohrbacher and Fr. Edmund Penisten.